With no dedicated OA/Indian Village staff this year at camp, the summer camp chieftain and ceremonies teams are having a rough time managing their primary camp duties as well as the prep work that needs to happen for OA activities (new camper green neckerchief ceremony, Brotherhood testing/ceremonies, Ordeal call-outs, and Friday night Ordeal/Brotherhood recognition). If you are available, we’re looking for some volunteers to simply come up and help build fire lays for these activities, and some other jobs related to OA events at camp. If you are able to come up to assist Sunday, Wednesday, or Friday afternoons/evenings through the Summer camping season, they would be very appreciative. Contact John Conlen (Outdoor Skills) or Ben Weber (Ranger) at camp. 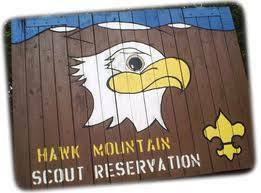 Also, if you are attending camp at HMSR with your troop, please consider helping out with OA activities during the week. If you are Brotherhood eligible, you can take your Brotherhood Review and ceremony during your week at camp too! NOAC Fund-Raiser Flaps Are In !!! Kittatinny Inc has started distributing them at camp on Wednesday nights at cracker-barrel. These patches were by pre-order only. They are packaged up by name and are available to pick-up. An email will be going to those that ordered them asking if they would like them to be available for pickup at camp or at the Service Center. Once we know what your preference is, we’ll get them to the designated location and let you know. A very limited number of extras were ordered to even up the order counts, and are being sold first-come, first-serve at Kitty Inc at cracker-barrel on Wednesdays (10$ color, $15 black ghost), with proceeds going directly into the NOAC fund. James E. West Fellowship Flaps Are In !!! The James E West flaps are in, and Kitty Inc has started selling them at camp on Wednesday nights at cracker-barrel. Because we would like as many members as possible to be a contributing participant of the James E West awards we will present to council, we discussed with Kitty Inc, and decided that in order to distribute them as equitably as possible over the summer, we have set aside 1/2 of them (150 flaps) and have 25 available for sale at each Wednesday night cracker-barrel, with members allowed to purchase only 3 at that time. We know some of the bigger patch traders and collectors would like more, so the other 150 patches will be used for larger contributors, and they will be able to purchase no more than 10 for now. If you fall into this category, please contact the Lodge Adviser, Glenn Piper. The plan is that there will still be some available for general membership to purchase in September and/or open up to additional sales to people who have already purchased some. All proceeds go toward the two James E. Wests we will present, with residual income to the general lodge fund. 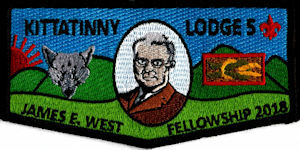 James E. West flaps cost $10 each and are only available to Kittatinny Lodge members. We are almost out of the old lodge T-shirts, but the ones we still have in stock are available for purchase from Kitty Inc on Wednesday nights at OA Cracker-barrel at camp. The new design “United by the Order” & “Kittatinny Lodge V – Est. 1921” below should be available for sale around mid-July. Cost for T-Shirts is $12. NOAC is just a few weeks away. If you are attending, you can now modify your schedules online using the NOAC registration site. If there are any questions about NOAC, please contact our contingent leader, Matt Davenport. Contact info for Matt is in your Wolf’s Tale, emails, or you can send an email to noac@kittatinny5.org.